NYPD and Shomrim at the scene of the assault on Jews in Crown Heights early last Wednesday morning. The Crown Heights Jewish Community is reeling from a spate of assaults, and law-enforcement personnel are vowing to crack down on a rise in hate crimes in that community. There have been 11 assaults on Jews in the past month alone, according to a Crown Heights Shomrim spokesperson. In the latest incident, a gang of three young men, aged 18-21, assaulted a 51-year-old Jewish man around 1:00 a.m. last Wednesday, in an attack captured on surveillance video. A few minutes later, one of the gang punched a 22-year-old yeshivah student from behind. By Wednesday afternoon, all three attackers had been arrested and charged with hate crimes. Earlier in the week, a 32-year-old believed to have randomly punched and pushed Jews in Crown Heights was arrested and charged with attempted assault and harassment. Crime statistics released by the NYPD Tuesday show a significant increase in hate crimes in New York City, even while overall crime has dropped. From Jan. 1 to Feb. 3 of this year, there were 42 reported hate crimes in the city, compared with 19 in the same period of 2018. More hate crimes were anti-Semitic – 14 out of 19 last year, 28 out of 42 in 2019 – than against all other groups combined. Hate-crime statistics include property crimes such as etching or spray-painting swastikas. At a press conference Tuesday to discuss the crime statistics, NYPD Chief of Detectives Dermot Shea said that one perpetrator accounted for 10-15 of the incidents. 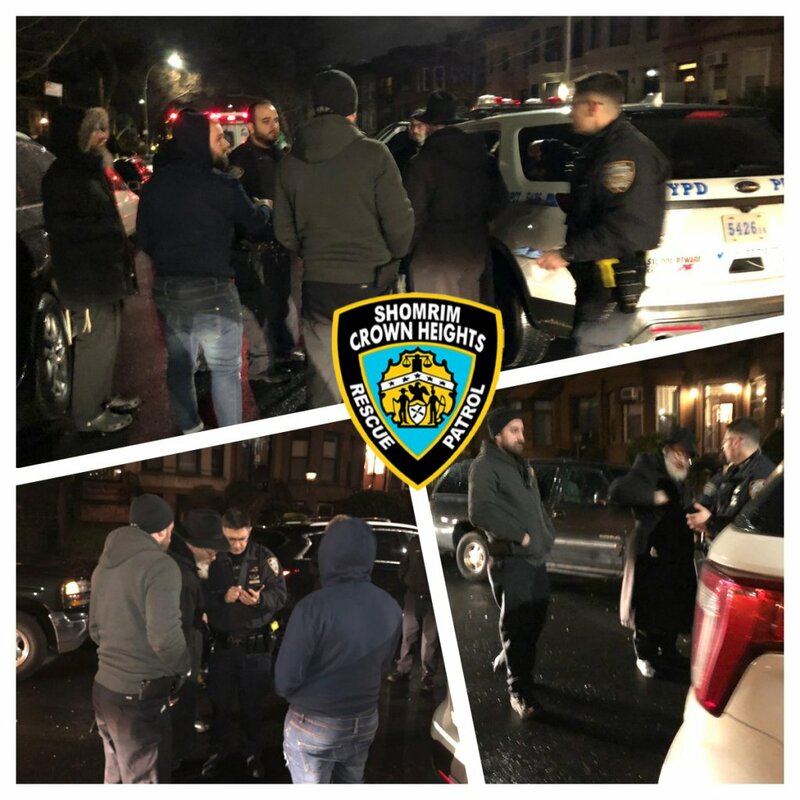 In response to the recent attacks in Crown Heights, the NYPD has vastly expanded the numbers of officers and patrols on the streets of that neighborhood, particularly between the hours of 5:00 p.m. and 1:00 a.m., when these assaults have generally been occurring. Communal leaders who spoke with Hamodia praised the police response but said that the most important work is getting at the root cause of the attacks. “I hope that police get to bottom of this and find out if there is a link, if perhaps the attackers are from the same school or the same house of worship,” said Rabbi Yaacov Behrman, a community activist. Rabbi Shea Hecht, another community activist, says that he believes the problem can be traced back to 2014, when then-Brooklyn District Attorney Kenneth Thompson stopped prosecuting low-level marijuana offenses. Others, including Brooklyn’s chief law-enforcement officer, do not doubt that the recent spike in crime is driven by hatred. “This issue of hate crimes has creeped back into our communities, and it’s something that as a DA I’m committed to stamping out,” Brooklyn District Attorney Eric Gonzalez said Sunday, in an interview on 770 WABC. In November, Gonzalez briefly came under criticism from some in the Jewish community for initially declining to bring hate-crimes charges on a car-service driver who assaulted Jewish men in Boro Park. Gonzalez defended his actions then, in an op-ed published in Jewish media, by saying he was being deliberate in ensuring there was a strong case before pressing a hate charge. The suspect was eventually indicted for a hate crime. Gonzalez has since been outspoken on the issue of hate crimes. In December, he created a new Hate Crimes Bureau; it had previously been a unit in the Civil Rights Bureau. Gonzalez vowed in the radio interview Sunday that his office would “vigorously prosecute” hate-crimes cases. But the District Attorney’s office won’t just be prosecuting these crimes, said Gonzalez. Rather, he will seek to be “forward-facing,” by meeting with, and bringing together, leaders from various communities to try to find the causes and motivations of these crimes. One cause, believes Gonzalez, may be the lack of interaction among races. Martinos, the Community Affairs detective, is working to arrange visits to five local schools by the NYPD’s Youth Safety Division. The officers speak to the children about youth-on-youth violence, bullying and diversity. One African-American activist is seeking to arrange school visits on his own. Davis, Executive Director of the James E. Davis Stop Violence Foundation — named after his late brother, a City Councilman who was murdered — is seeking to have black and Jewish leaders join this listening tour.